Thank you, Delilah, for having me on your blog today. I hope everyone had a wonderful Christmas and look forward to a prosperous New Year. Hi everyone, I’m Janice Seagraves, and I am a published author of nine books, three of which are series, and five short stories published in anthologies. I write in various romance genres; contemporary, paranormal, science fiction, and fantasy. Let me walk you through my process as I wrote a series. First off, let’s talk about story ideas. I get ideas all the time. Watching the news can spark ideas or a trip to the mall. A walk through my neighborhood helped me develop a scene in Year of the Cat (my paranormal romance). Do I get ideas from my dreams? Sometimes. If the dream is interesting enough to remember. Sometimes they’re not or they’re disjointed. When I wrote Matrix Crystal Hunters it came from a dream. A woman was on another planet, there was these funny rocks she was examining, and she discovered they gave of energy. There was also a man who crept into her tent, and she nailed him with a frying pan. I had to figure out how these two things fit together and wrote the story. And then I decided on the genre and setting, it was going to be a science fiction romance set on another planet. A desert planet. I also had to figure out the what ifs. What if… their team’s geologist, (I decided to call her Maya), heard of a crystal that would multiply energy. Okay, I know that sounds bad, but you’ll have to read the book to see why it works. When I wrote Matrix Crystal Hunters it was exciting. The story came together fast. I’d go to bed late and get up the next morning to turn the computer and write some more. I love those times. It feels like magic as I ride the wave of creativity and the story seems to flow straight from my fingertips and onto the computer page. I don’t know about the self-doubt, but I do go over and over my finished manuscript until I feel it is as sanded and polished within an inch of its life. After the first story was published, the characters kept talking. So, I kept writing. Book two came out, Matrix Crystal Christmas. It’s made up of two short stories. It wasn’t originally supposed to be about Christmas, but the Christmas season was coming up and I thought I’d add some Christmas elements to the last chapter of each story. In “Crystal Flower Christmas”: Vach and Maya are on a mission to undam the Laonooco River for the drought stricken region. 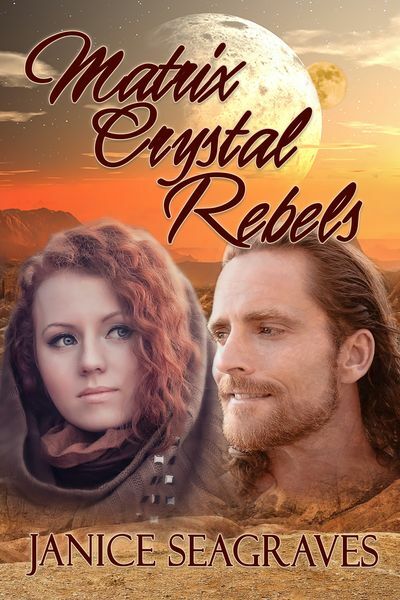 As heartache fractures their marriage, will the gift of a crystal flower mend their relationship or break it beyond repair? In “Crystal Clear Christmas”: Plague has struck the village of Zama and the citizens blame the only human left on Zenevieva, Maya. Will Vach make the ultimate sacrifice to save his wife? What if… the humans came back, and their greedy Earth government wanted the matrix crystals to exploit? What if… their geologist though talented in finding and shaping crystals was painfully shy? River’s story was published last year. Okay, fine. I wrote the next book, Matrix Crystal Rebels, and it was just published 12-19-2017. So just a few days ago. I’m proud of Matrix Crystal Rebels, I think it is my best work so far. I felt the same way I did while writing Matrix Crystal Hunters. I went to bed late and got up early to write some more. As I wrote the story, it flowed effortlessly.